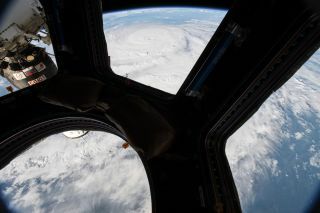 During my first spaceflight aboard Space Shuttle Columbia, I watched, incredulous, as Hurricane Emilia churned as a Category 5 storm. I think it's time for everyone to admit that black holes are annoying. Time Travel Isn't Possible…Or Is It? Albert Einstein's theory of general relativity suggests backward time travel is possible in some scenarios, but do those situations ever exist in our universe? During the total solar eclipse, skywatchers can see the corona: the hellish, mysterious outer atmosphere that NASA plans to probe in 2018. During my mission aboard the International Space Station (ISS), I shot what I was told was the first astronaut video of a partial eclipse. There's a lot we don't know about the sun — including how its outer atmosphere gets so hot. In the 1690s, astronomer Edmund Halley had a problem. I suppose there is a small chance you'll miss the upcoming total solar eclipse as it crosses the United States on Aug. 21. If the moon typically rises in the east, why will the 2017 total solar eclipse begin in the west? Let's say you're not lucky enough to find yourself along the narrow strip of totality during the coming solar eclipse on Aug. 21. Don't feel bad — you still may get a stellar view.